2017 was an incredible year for basketball shoes. From dynamic debuts to colorful collaborations, basketball sneakers took the spotlight on the court. Nike surely dominated the basketball court in 2017. Not only by becoming the official outfitter of the NBA, but through the many athletes that rocked the brand’s logo on sneakers. This was the case during the 2017 NBA Playoffs, with more than 50 percent of NBA players wearing shoes featuring the Swoosh. However, other shoe brands such as Adidas and Under Armour also made their stamps on the basketball court in 2017. Damian Lillard isn’t the flashiest player in the NBA, but he certainly is known for coming up big in crunch time. His fourth signature sneaker with Adidas, the Dame 4, doesn’t feature much tech-wear compared to the Crazy Explosive. However, it is supported by a full-length BOUNCE cushioning system and mesh upper. Priced at only $115, it is one of the more-affordable sneakers on the market. It’s been a wild ride for Paul George’s basketball career. Though his stardom has fallen a bit, he is still one of the best two-way players in the league. Finally, in March 2017, the wait was over when George became the 21st Nike athlete with a signature shoe. 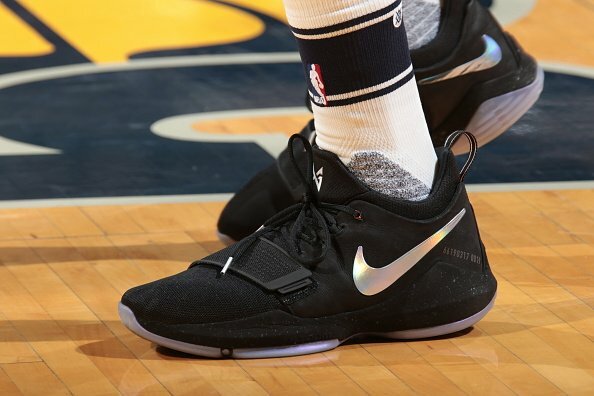 With his debut sneaker, the PG 1 are considered one of the more well-received shoes currently on the court. Kevin Durant just captured his first NBA championship and continues to be one of the league’s best players. As a four-time scoring champion and former MVP, he is also one of Nike’s top athletes. Yes, the KD 10 looks almost similar as the KD 9. But, it takes on Durant’s image as a long and lanky low-top shoe fitted with heel support and cushioned soles.